Double Date is a vocal quartet formed in 2012. They met in choir at the University of Missouri-St. Louis. They won the Barbershop in Germany! World Mixed quartet competition two times. The first time in 2014, and the second in 2016. The quartet's repertoire includes songs in many styles. They perform at community and church events, barbershop shows, parties, and weddings. 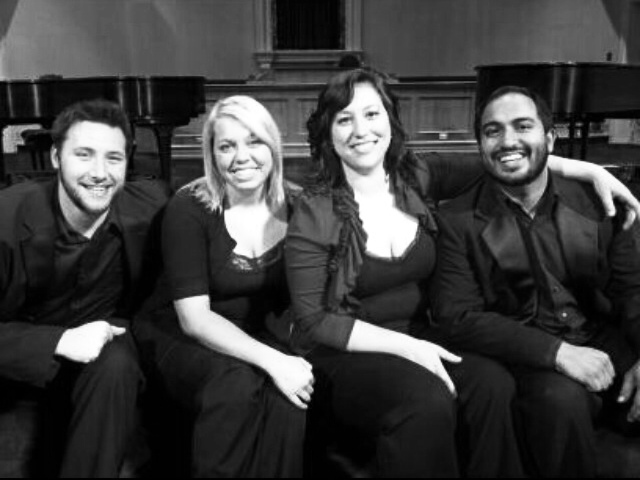 This long distance quartet consists of two couples: Michaela and Nathan, and Blair and Ravi. They're best friends. Their two beautiful dogs are best friends, too. Blair Brown grew up in Lake St. Louis, Missouri with her parents and two older brothers. In December of 2013, she graduated from the University of Missouri-St. Louis with a degree in Vocal Music. She serves as the women’s section leader at St. Francis de Sales Oratory Schola Cantorum and as a floral assistant at The Crimson Petal in St. Louis. In addition to singing, she enjoys cooking and reading. Blair and Ravi live in St. Louis with their cat Guillermo and dog Buddy. Nathan Johnston grew up in Hillsboro, Missouri. He started singing at a very young age with his family bluegrass band. Nathan currenty lives in Fort Myers Florida teaching elementary music. Nathan earned his bachelor degree in music eduction in 2015 from the University of Missouri-St. Louis. In addition to his degree he is holds an audio engineering certification. Nathan was formeraly a member of the Ambassadors of Harmony, and is was also very involved with his college choirs. In his free time Nathan enjoys playing video games, and playing with his dog Tag. Ravi Raghuram was born in Louisiana and raised in North Carolina. He earned a degree in Liberal Arts at Soka University in 2007 and completed a degree in music education at the University of Missouri-St. Louis in 2013. He teaches choir at Brittany Woods Middle School. He also serves as the men’s section leader at St. Francis de Sales Oratory Schola Cantorum, teaches voice and piano at Dave Simon’s Rock School, performs as the bass Young Artist with the Bach Society of St. Louis, and is a baritone section leader with the Ambassadors of Harmony. Michaela Slamka sings the tenor part and resides in Fort Myers, FL where she teaches elementary music. She is a double majored in Music Education and Music Theory at the University Of Missouri-St. Louis. She comes from a family of barbershoppers. Her father, Mike Slamka, is the lead of Crossroads, the 2009 BHS International champions. Her father also won the BHS International back in 2003 in Power Play, along with her grandfather and two uncles. Her two sisters, Mackenzi and Madison, also sing. In fact, Michaela, her sisters and her father sing in a family mixed quartet. Her mother Traci is the quartet cheerleader and fashion advisor.